These hand-picked Hyperion interview questions and answers will help you clear your Hyperion job interview and get your dream job. As part of this Hyperion interview questions you will learn about Hyperion Planning & its main features, Hyperion Financial Management, comparing Attributes & UDAs, Essbase MDBMS and more. Learn Hyperion from Intellipaat Hyperion certification training and fast-track your career. Wide array of products Oracle EPM releases multiple application modules for business, finance, accounting, etc. Hyperion is a database that allows you to access the data very quickly. The company was bought by Oracle in 2007 and Oracle has continued to improve the product.The Fancy name of Hyperion is Business Intelligence and it aims to support better business decision-making. Thus a BI system can be called a decision support system (DSS). Though the term business intelligence is sometimes used as a synonym for competitive intelligence, because they both support decision making, BI Uses technologies, processes, and application to analyze mostly internal, structured data and business processes while competitive intelligence gathers, analyzes and disseminates information with a topical focus on company competitors. 3. What is Hyperion Planning? Hyperion Planning is a budgeting and forecasting application from Oracle formerly owned by Hyperion Solutions Corporation. Hyperion Planning uses Essbase (s multidimensional database product sold by Hyperion) as a database and calculation engine, a relational repository for business logic, and includes a web-based user interface. The Software allows you to add planning or forecast data to actuals. You can use Web Forms to add the planning data or use the Excel SmartView tool. 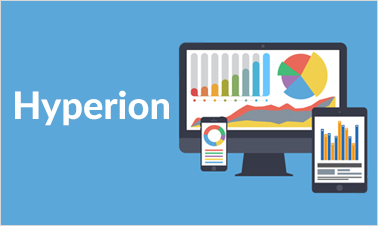 Most of the Hyperion reporting tools work great with planning. Become Hyperion Certified in 16 hrs. 4. What is Oracle Hyperion Financial Management (HFM)? Financial Management can be deployed quickly to integrate data from multiple Oracle and non-Oracle transactional systems, provide top-side reporting that conforms to IFRS requirements, and help organizations make the transition to IFRS. Master financial management with the in-depth Hyperion Certification Training! 5. What are the different types of LOG Files? Suppose we have assigned Generation 2 and Generation 4 as of now and think of adding generation 3 later some time. Now can we build the dimension? No. If gen 2 and gen 4 exists, we must assign gen 3. A classification of a member in a dimension. You can select and group members based on their associated attributes. You can also specify an attribute when you perform calculations and use calculation functions. Eg: The database in Sample Basic which has product dimension has some attributes like size, package type, and flavor. We can add these attributes to the dimensions where we can retrieve the data like for example to retrieve “coke with 8 Oz with bottles”, this is useful for generating reports. Learn more about Hyperion Planning Training in this insightful blog now! 7. What is TB First and TB Last? TB First: in the Sample.Basic database, the accounts member Opening Inventory is tagged as TB First. Opening Inventory consolidates the value of the first month in each quarter and uses that value for that month’s parent. For example, the value for Qtr1 is the same as the value for Jan.
TB Last: in the Sample.Basic database, the accounts member Ending Inventory is tagged as TB Last. Ending Inventory consolidates the value for the last month in each quarter and uses that value for that month’s parent. For example, the value for Qtr1 is the same as the value for Mar. 8. How does Attribute dim impact report performance? They highly impact the report performance as the attributes are calculated dynamically when referenced in the report. For very large number of attribute dim displayed in the report, the performance could drastically reduce. While loading the data, you have applied both the selection criteria as well as rejection criteria to a same record. The record will be rejected. 9. Mention the main Features in Hyperion Planning v11.1.2.3? The latest release of Oracle Hyperion Planning, v11.1.2.3, offers new key features for users and administrators, including ASO support within Planning, more flexibility to import and export metadata, and task list report visualizations. MijaDeering, Principal Solutions Manager at Edgewater Ranzal, provides an overview of these and other features of the newest Planning release. Her presentation also includes a live demo of key features and an opportunity for viewers to ask questions and better understand the product’s enhancements.Oracle Hyperion Planning is a centralized, Microsoft Office and Web-based planning, budgeting and forecasting solution that integrates financial and operational planning processes and improves business predictability. It allows organizations to reduce planning, budgeting, and forecasting cycles by weeks or months and improve accuracy of plans and forecasts. Microsoft Office products are used as an interface into Oracle Hyperion Planning, so the learning curve for users is minimized, and Planning speeds up the time it takes to update plans and refresh reports. The cost of ownership is reduced through superior application deployment, management tools, and packaged data integration. 10. How is data stored in the Essbase database? 11. What is the difference between UDA’s and Attribute dimensions? Attribute dimensions provides more flexibility than UDA’s. Attribute calculations dimensions which include five members with the default names sum, count, min, max and avg are automatically created for the attribute dimensions and are calculate dynamically. Master Oracle Hyperion with the industry-designed Hyperion training course. 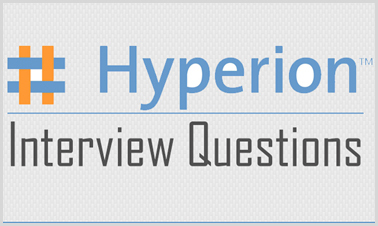 "0 Responses on Top Hyperion Interview Questions And Answers"
Sign Up or Login to view the Free Top Hyperion Interview Questions And Answers.